Summer clearance sale on now. Since moving into our new location in the gorgeous community of Woodbine, Racquet Network has been able to offer more athletic wear of different styles, colors, and sizes. 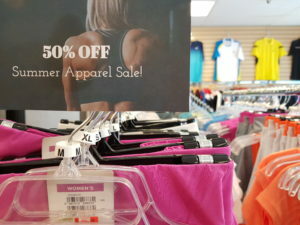 With summer already begun, our first ever Summer Apparel Clearance Sale is well in motion, where customers can get premium ladies and junior Wilson apparel for 50% off or more. Dozens of tank tops, tee-shirts, capris, hoodies, and skorts of a variety of colors and styles qualify for this big sale. For a limited time, get 50% or more off select Wilson ladies and junior apparel, suitable for almost any athletic activity. Stop by our store in Woodbine to browse our full selection and take advantage of this great offer.